I retrieved my vintage Sol-20 microcomputer from my storage vault and I am about to begin restoring the keyboard. I dusted it off and took a picture, it’s old and a little dinged up, but it sure is a beautiful piece of hardware. The Sol-20 is legendary for several unique features such as the solid walnut side panels and the one-piece construction. 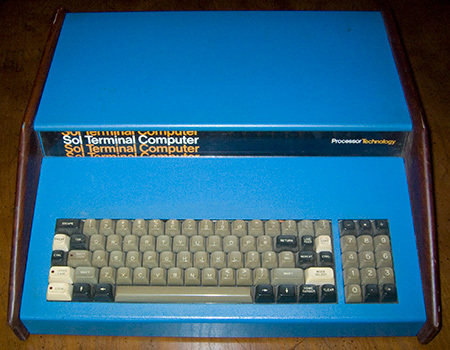 When the Sol was released, most microcomputers were naked circuit boards like the Apple 1, the Sol was the first microcomputer to have everything in one box. The Sol kit came with the keyboard pre-assembled, it was considered too tricky for hobbyists to assemble on their own. And of course, that turned out to be the piece that everyone has to disassemble and restore. Oh well. I have just started to resurrect one of the three SOL20s that I own. All three have defective key boards. Does anyone have a way to replace the contact pads in the keys?